The first recorded Baptist in Hawridge was John Hich, a former soldier who settled in Hawridge and was reported in 1646 to preach in ‘the said Hawridge and places adjacent, and labours at markets, fairs and private meetings (which he has almost every Lord’s day)’. The first record of a Baptist church at Hawridge is on the 16th July 1798 when Edward Sexton, the pastor of the General (now called Broadway) Baptist Church in Chesham applied to register William Wright’s house on Hawridge Common as a Baptist Meeting House. The Wright family owned Botchmore (now called Bowmore) Farm. 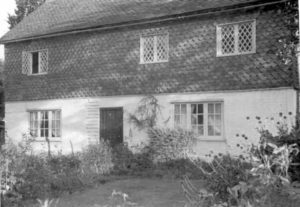 About 1811 a building was erected adjacent to what is now called Holly Cottage near the farm. In 1823 this house was occupied by William Garner, and these adjacent premises were registered as a place of Baptist worship. The leaders of the church were George Sills, Robert Wright, William Garner and William Haws. The church had a service most Sundays and a Sunday School. In April 1830 the pastor of the Chesham General Baptist Church, Edward Sexton, wrote: ‘A House at Hawridge has been Registered in the Archdeacons Court at Aylesbury, as a place of Public Worship by some Protestant Dissenters of the General Baptist Denomination; in which they have divine Service most Sabbath days -at which a small congregation attends – there is also a small Sunday School’. In the ecclesiastical census of 1851, the minister Samuel Ayrton reported that Hawridge Baptist Chapel could seat 100 people, and had a congregation of 60 people. Until 1878 the church was run by the Wright family as a branch of the General (now called Broadway) Baptist Church in Chesham. After the death of John and Edward Wright, Botchmore Farm and Holly Cottage were put up for auction by the Wright family on 10th April 1878. The advertisement in the Bucks Herald on 6th April 1878 described ‘a freehold cottage and building adjoining, which has been used for many years as a Baptist Chapel, with garden adjoining Hawridge Common, yard, workshop, wood-house, small orchard, with pond of water…’. The farm, cottage and chapel sold separately. Baptist Church in Tring, Hertfordshire. Hawridge church was then run as a branch of Akeman Street Baptist Church in Tring. Frederick Butcher was a wealthy man and used his money to help the Baptists (especially Strict Baptists) with chapel projects in the Chilterns. In 1880, 60 children from Hawridge Baptist Church and 220 children from Akeman Street were amongst 1,162 children who took part in an inter-church nonconformist Sunday School festival in Tring to mark the Sunday School Centenary. After this date the church declined. The demise was probably hastened by the arrival of a rival church –Hawridge Mission Hall, which opened down the road in Hawridge in 1879. Members may also have been attracted by new Baptist chapels in nearby villages: in 1882 Frederick Butcher bought the former British school at Lee Common and gave it to the Strict Baptist church in the village, and in 1904 Frederick Butcher helped pay for a new Baptist chapel at Wigginton. By 1907 the Hawridge Baptist chapel is described as being ‘in ruins’. On 4th February 1916 Rebeckah Fincher of Holly Cottage bought the adjoining garden including the ruined chapel from Frederick Butcher for £10. The chapel was demolished and its foundations now lie beneath the garden. Today nothing remains of it and most people are oblivious it ever existed. If anyone knows anything more about the churches at Hawridge please contact the Society.